Most fans of English visual novels know Deji-chan’s work…even if they don’t ‘know’ anything about her. A native of Chile, M. Beatriz Garcia has been doing commercial work since 2009 and her incredible skills can be seen in some of the most noteworthy English VNs of the past two years. Currently she is working on the third game of SakeVisual’s Jisei series, the sequel to The Flower Shop from Winter Wolves and several others VNs as well as professional commissions. We are honored to have her here as part of our monthly interview series! VNs Now: Just between you and me (and the hundreds reading this) what are some of your favorite characters that you’ve designed so far? Deji: From The Flower Shop and its upcoming sequel, Susana, Steve and Natalie are my favorites, definitely. The girls from The Parasol Festival (still under production) with all their folk-ish clothes are also among my favorites, and Chance from Jisei series is also a character that has been fun working on. Now, I wish I could take credit on the design of some of the Sakevisual characters I adore drawing, like Kuu (from Ripples), Kurara (Sakevisual’s mascot) and Li Mei (Jisei series), but they’re originally Ayu’s designs that I just redrew, so credit goes to her! VNs Now: Shifting gears just as little bit, what are your personal goals as an artist? What are some of the things you want to accomplish with what you do? Deji: I want to get better, so I can transport people to places and moments with what I draw. I want people to be fond of the characters that I get to draw. That’s what I like about art, myself, so I want to be able to make people feel what I feel when I look at art done by artists I admire. I feel really accomplished when somebody tells me that what I do has inspired them. VNs Now: I was legitimately surprised when I found out where you were from. Did growing up in Chile influence your art? In Chile, we look up to a lot of other countries and people, but it feels like we’ve yet to be able to do great things ourselves that people will look up to. That makes one think that everybody else from more artistically developed countries will be better than you, no matter what you do. 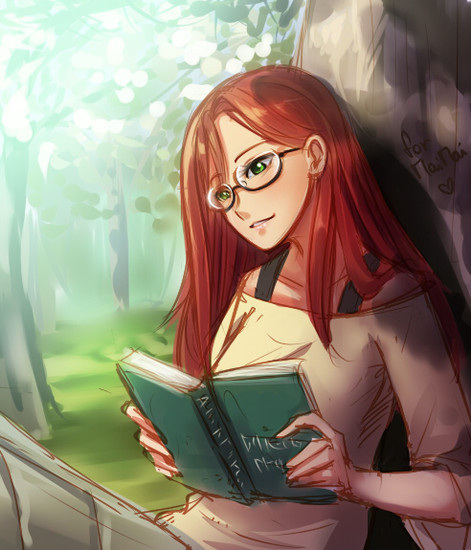 VNs Now: For all of the aspiring artists and visual novelists who are reading this right now, what would you tell them to help them reach their own goals? Deji: First, practice a lot. Second, we all have that big dream project we want to do, and we never feel we’re good enough for it. You know, it’s better to work on smaller things that you can do right now and finish them. If what you just did is not that good (even if it’s the best you can do right now), you can always learn from it and make the next one better. And then the next one, and so on… and then you’ll look back at all those things (it may be embarrassing!) and see this ladder that has helped you get you to where you are. And you know, at some point that ladder will lead you right to your dream project, and you’ll be ready to tackle it and make it awesome! VNs Now: Thank you very much and good luck on your new projects! Follow Deji on her Tumblr, Twitter and her DeviantArt Page!